Only got around to watching this one today, as I no longer get BBC America. New title sequence... Love the visuals, not so sure about the actual music. The Doctor's got some pretty bad post-regneration trauma this time around, and Clara's not sure if he's still the same man. Could've been worse, Clara... He could have tried to strangle you. Once again, it's good to see Vastra, Jenny, and Strax. I know I say this every time we get an episode with them, but I would love to see them get a spin-off. Interesting villains to bring back for the Twelfth Doctor's premiere episode: The robots from "The Girl in the Fireplace". Well, not the exact same robots, they're from a sister ship of the other one, and once again, they're harvesting human parts to repair themselves and their ship. Cameo from the Eleventh Doctor! We get another "You've redecorated... I don't like it." This time, it's from Clara as the Twelfth Doctor has slightly changed the TARDIS control room yet again. Hmm... So the Promised Land is real, and there's a quirky woman there who fancies herself the Doctor's girlfriend? I smell this season's story arc! Overall, I liked the episode. It had a pretty dark tone to it, and the Twelfth Doctor seems to be a much more dangerous man. Oh, almost forgot! We finally get back around to the mystery of who gave Clara the TARDIS' phone number back in "The Bells of St. John". The Doctor theorizes the same individual put the ad in the newspaper so he and Clara could find each other. New theme lacks the Middle Eight, just like the last Doctor. Didn't care for the previous one either, but this one just loops the last three notes over and over in the end, very boring. Showing DW to my girlfriend now, we are at "The girl in the fireplace". First time I rewatch it, never before in HD, such a nice ride. Thinking of stopping when Tennant leaves, unless she insists on going on. I will say, having seen Capaldi in "In The Loop", I enjoy the dry wit and "I won't be your boyfriend" line drawn. 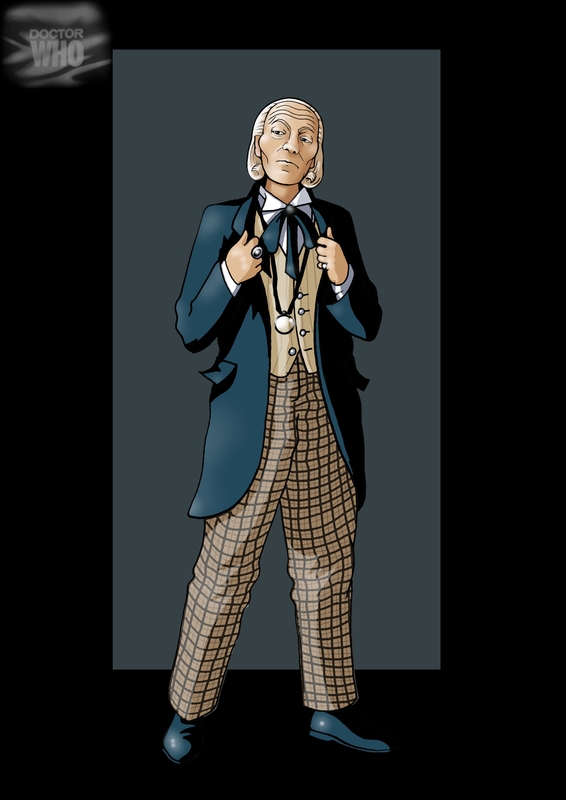 This, coupled with his chosen attire, which reflects William Hartnell's First Doctor, makes me feel like this can be a good ride. Even though he started with robbing a tramp. One thing stuck with me, though; I clearly remember that David Tennant wanted to make his Doctor scottish, since he is so himself, but he was shot down by management before his first episode filmed, because they thought "the Doctor is never local", and now suddenly they have reversed their stance and allow Capaldi to scot out as much as he likes? I'm not complaining at the scottishness in itself, but the loose policymaking. Well, considering the joke early in Eccleston's first episode about his Doctor's northern accent, it couldn't have been a very strict rule. But, even so, there's certainly different people running the show now than when Tennant started. For all I know, there may be different people running things higher up in the BBC, too. It's not too surprising that the backstage "rules" might change over time. The years 2005 to 2010 were under Davies' tenure, while the years 2010 to present were and are under Moffat's tenure. I have been going through the list of the top Classic Doctor Who episodes, according to the latest survey. The best stories are those which are focused on an A story. I think the same could be said for the New Doctor Who, as well. I think it's even more important for the new series, with the majority of episodes being 45 or 46 minutes. This is the equivalent of two of the Classic Doctor Who episodes, so the episode has to be tighter. When it isn't, the episode suffers. I like (but did not love) this episode. Gotta say, I was very impressed with the acting and direction of this episode- though the plot and the antagonists were poorly concieved to ay the least. Worth commenting on in particular is the scene where the Doctor is berating the clockwork android- asking it what's left of the original if every piece has been replaced- all while he's holding a silver serving tray up as a mirror- which nicely catches the doctor's reflection as well and it's obvious that his words are not lost on him and that his critique could just as easily apply to himself. The phone call scene, which I thought was excellent and VERY nicely handled-that was, to me, where we first reallysaw the new Doctor- when he gives the "I'm not your boyfriend" line- and while unsaid, it seems clear that his older look is to draw that line in the sand. I really like the new look of the Tardis- very clean and new looking both within and without. The Doctor's new duds are very nice as well- much more practical than some of his old series getups! As a loooongtime fan of the old series, I liked the nods to it in this episode- the bit about the long scarf and the Tardis interior needing "more round things" were funny- particularly since he did not seem to recall what exactly they were for. As to the Doctor's "girlfriend" in "The Promised Land", I do believe that she's the Tardis itself and the "Promised Land" is something created within the Tardis' computer- and that The Doctor found a means to harvest the AI of the clockwork android as a first step to "cleaning up my messes". I very much hope they have the Doctor doing exactly that- revisiting some older adventures and setting some things right. Hell, I'd have him go back and save Adrick from the Cyberman's bomb (5th Doctor) and visiting his grand-daughter (1st Doctor). The Scot accent takes some getting used to, and his mumbling a bit does not help, but overall, I'm digging the changes.